Our landscaping was completely spontaneous and unplanned. We bought our home in January of 2011, and upon the arrival of spring, we began replacing our 80’s style boxwoods with whatever plant we liked. Seeing as we’ve ended up with an assortment of oddly placed shrubs, flowers, and small trees lacking cohesiveness, I’ve learned that a landscaping plan will be in order for the next go around. However unkempt our landscaping might be, we happened upon our lovely hydrangeas with this method. My hydrangeas bloom constantly, and I like to think that their blue tones actually help to embrace the blue siding of our home. It’s a stretch. As early summer advances towards August, the blue hydrangeas develop more and more purple and green hues. At this stage, I love them the most. The blooms possess a very vintage ambience, and add so much color and life as a centerpiece on my dining table. Fortunately, this stage of blues, greens, and purples also acts as a notice for me that my blooms are reaching the end of their summer cycle. I’ve only recently realized the satisfaction of preserving my hydrangeas through an impossibly easy method of drying. Give this a shot. There’s very little work involved, and you’ll be in love with the dried blooms that are perfect for many different arrangements or interior decorations. Beginning in late summer, hydrangeas begin to dry out on their own. At this stage, and before too many petals turn brown or wilt, I cut armfuls of the flowers for drying. They may already feel a bit crisp, which is great. I remove the leaves from the stems, simply because the projects I use the hydrangeas for work better without the leaves. 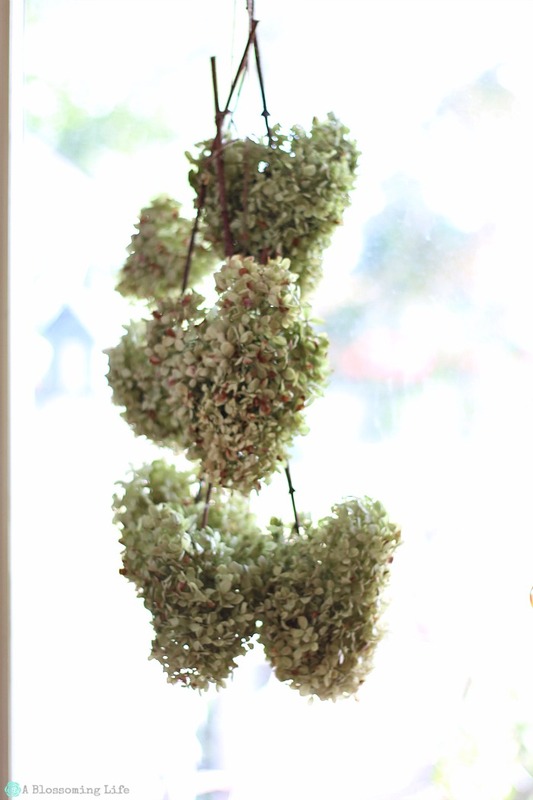 I’ve hung my hydrangeas upside down with twine, and I’ve also dried them sitting upright in a dry vase. Each technique resulted in beautifully dried blooms, so do as you like. However, if you hang your flowers upside down, do so in a fashion that allows them to hang free from touching walls or furniture. Reason being, the side that is touching a wall, for instance, will more than likely develop a flat spot that doesn’t look so great when you’re displaying them later on. The stems dry and turn brown as the flowers dry. This is a great indicator of the progress. Your hydrangea petals will turn papery crisp, but they are surprisingly resilient. I lost very few petals while handling my dried flowers. I’ve heard of others using hairspray to help the preservation of the hydrangeas as they dry, but I didn’t use any, and my flowers dried perfectly and with excellent color and form. I’ve placed arrangements of my dried hydrangeas in the kitchen, master bedroom, and even in my daughter’s room. 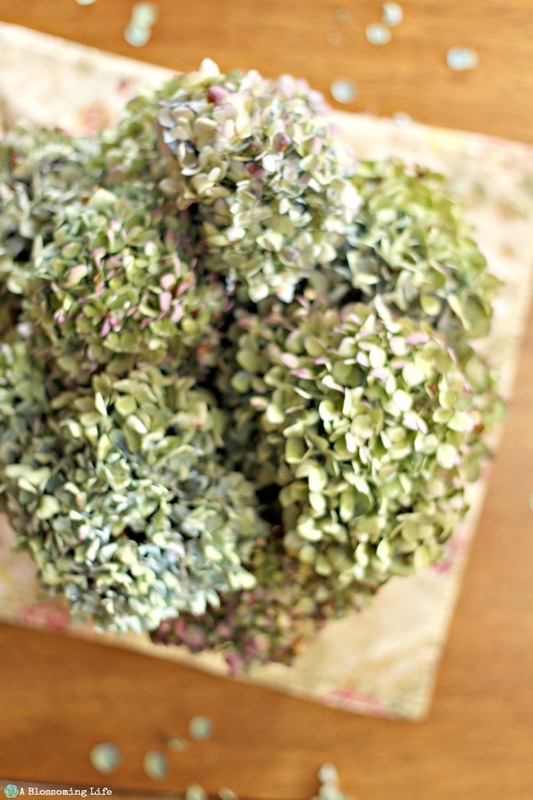 Dried hydrangea wreaths are stunning, as well. 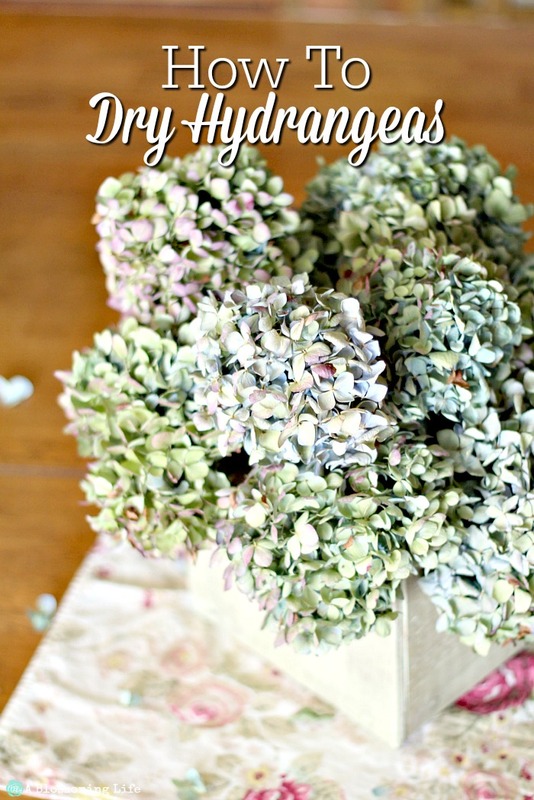 I have some more plans in store for my dried hydrangeas, and if I love the results, I’ll be back to share them with you. Until then, go check on your hydrangeas and dry what you can. I think you’ll be happy you did. I love Hydrangeas. I purchased 2 this year and placed them on my deck. I think I will plant them in my landscape this fall and allow them to reach their full potential. I’ll going to pin your post, so I can start drying blooms next season. Thanks for sharing, and please add your post to my Sunday’s Best Linkup. Thank you Rhonda! They are definitely one of the prettiest flowers. We were blessed to have 4 huge hydrangeas already planted at the house we bought. I hope yours grow big and beautiful too!